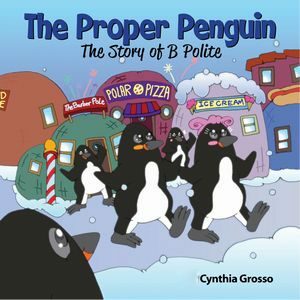 The Proper Penguin – The Story of B Polite was developed to help children and their parents to see civility in action. B Polite is a penguin that lives at the South Pole. The penguins that live there get their name from the pole-lights or the “Polites.”B is a nick name for Bentley.The story is a day in the life of B Polite, a penguin that lives in a cold place that is warm and friendly due to a kind way of life.It is a sweet story of the benefits of building a foundation of manners early in life. 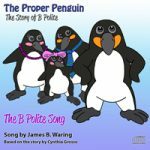 The story is written so that the children may connect with B Polite and see that kind actions are a desirable way to a happy life. The journey of civility begins at a very young age and the concept of B Polite was developed to help make the trip fun. B Polite is not so much about the rules, but rather, it is about respecting oneself first; enabling respect for others, i.e., the circle of life in the life cycle of civility.